Posting Scottish tennis star Andy Murray’s Twitter photo. Note: Here’s my post on chuffed. I’ve written a lot about various NOOBy uses of “bits” (for example here and here) but not Murray’s use, for which Americans would substitute “to pieces,” if anything. Nor has “jumper” (aka “sweater) made any inroads here, although, come to think of it, I bet Nancy Friedman has made some twee retail sightings. They say that whenever a Scots sports star or team loses, the London-based BBC say (or says!) ‘Scottish’ but when they win it’s ‘British’. 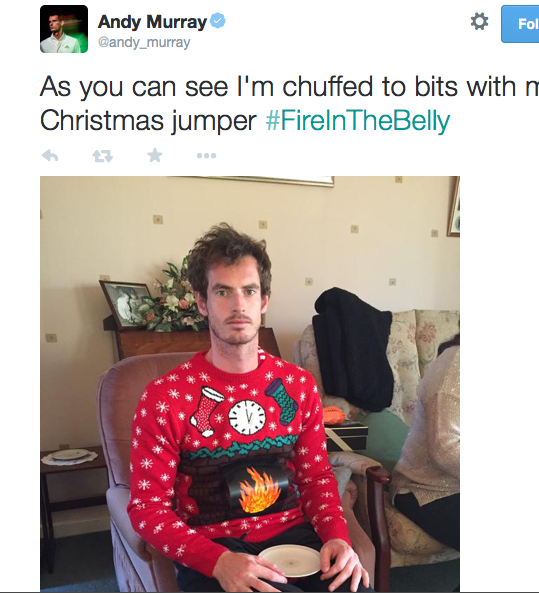 There sits Andy, dutifully wearing the awful jumper with Christmas motifs all over it. They are typically given by older, female relatives who are out of touch with taste and who have quite often knitted the jumper themselves. The young man will have to wear it throughout Christmas and pretend to be thrilled with it. Is the Christmas pullover/jersey/sweater a tradition in the U.S? Exactly. I have been listening to the BBC for more than half a century and have never heard it. I think this nonsense started as a joke and now everybody seems to believe it! And isn’t BBC Sport in Salford, not London? “Chuffed to bits” — that’s a new one on me, especially the “chuffed” part. Here in the US, many have “Ugly Sweater” parties. If you don’t have one, you check out Goodwill or Salvation Army stores. Might even find the one you donated! It seems to me that I saw this sweater online last year, except that it was battery operated. When you turned it on, the flames moved & licked at the wearer’s belly. Nope, haven’t seen it yet in US fashion journalism or retail!